bl.uk > Online Gallery Home	> Online exhibitions	> Asia, Pacific and Africa Collections	> Mir Alum Lake, Hyderabad. 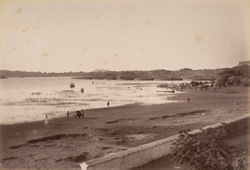 Photograph of the Mir Alam Lake, near the city of Hyderabad, Andrea Pradesh, taken by Deen Dayal in the 1880s. This is from the Curzon Collection: 'Views of HH the Nizam's Dominions, Hyderabad, Deccan, 1892'. The Mir Alam Tank, near Hyderabad, is a fine piece of engineering with 21 arches around the periphery, holding 20.7 sq. km (8 square miles) of water. It was built by French engineers and named after Mir Alam, the prime minister of the Nizam of Hyderabad from 1804-1808.